B5G series 3 in 1 water filling machine, also called monobloc water filler for 3 gallon - 5 gallon bottles is specially designed to fill the purified water and the distilled water, mineral water and other bacteria free water. As bottle filling machine integrates the processes of bottle washing, bottle filling, cap dropping, bottle capping and finished product delivering, water filling machine is able to complete bottle rinsing/bottle washing, bottle filling, and bottle capping/bottle sealing processing. It is the ideal choice of bottled water filling plant. Bottle filling capacity ranges from 60BPH to 2000BPH. Bottled water filling machine including below working steps, from empty bottle loading for bottle washing -> bottle washing with detergent liquid rinse and pure water rinse -> bottle moves forward to water filling system -> ozone sterilizer (Optional purchase) -> pure water bottle filling system -> cap sorting and cap feeding with cap feeder -> bottle capping with bottle capper -> finished bottled water output. Bottle water filling machine is compatible for bottling bottles from 3, 5gallon 6 gallon. If you want it to fill larger bottle than 5 gallon, please do send us your bottle sample or bottle drawing with detail bottle specification, then we can work out right water bottling machine as per your special requirement. 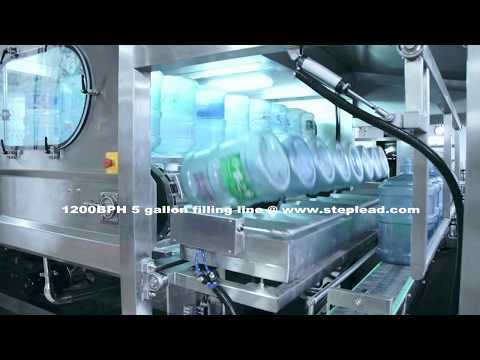 Whole operation of bottle filling machine is controlled by automatic PLC programmer system. The PLC system normally from LG, Mitsubishi or Siemens. High precisely and automatically operation, energy saved, environmental friendly and less labor needed. Drive motor, pressure pump most of them adopt reliable Chinese export standard products, if customer have high requirement in quality, international famous brands also available for option with slight additional cost. Water filling machine adopts high quality stainless steel material SS304 for machine body. The non-metal parts of bottle filler adopt innocuous and endurable PP plastic raw material to produce. Bottle water filling machine can be optional installed with hot CLO2 detergent bottle sterilizing for further bottle washing and cleaning. Easy and fast installation for complete water filling machine. The bottle filling time and water filling level can be flexible to be adjusted according to user's different requirement. Low pressure protection device, when incoming air's pressure is lower than 0.5MPa, PLC will send signal to stop the machine bottle washing, bottle filing and bottle capping automatically.